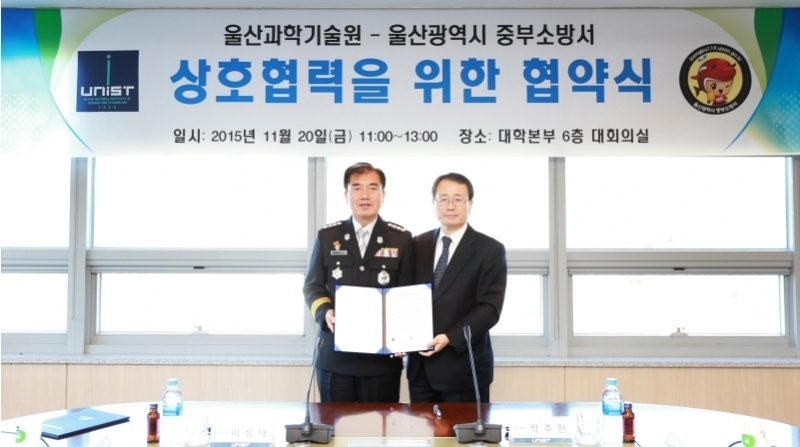 Joo-Hun Park, Director of Admissions of UNIST (right) and Sung Tae Lee, Fire Chief of Ulsan Jungbu Fire Station (left) are posing for a portrait at the signing ceremony for cooperation MOU. UNIST is committed to providing a safe research environment for its staffs, students, and researchers. Earlier today, UNIST signed a Memorandum of Understanding (MOU) with Ulsan Jungbu Fire Station to pledge mutual support for one another in the advancement of a strong, positive culture of safety within academic research laboratories at UNIST. The ceremony was attended by Joo-Hun Park, Director of Admissions of UNIST and Sung Tae Lee, Fire Chief of Ulsan Jungbu Fire Station, and ten other key officials from both organizations. The primary purpose of this agreement is to raise awareness of safety hazards and potential risks associated with reactive chemicals and laboratory operations to be used. The objective of establishing a strong, positive safety culture in a research setting is to identify and mitigate hazards that are foreseeable, employ general precautions that help protect against unforeseeable hazards, and ensure the capacity to respond to incidents in ways that minimize harm. 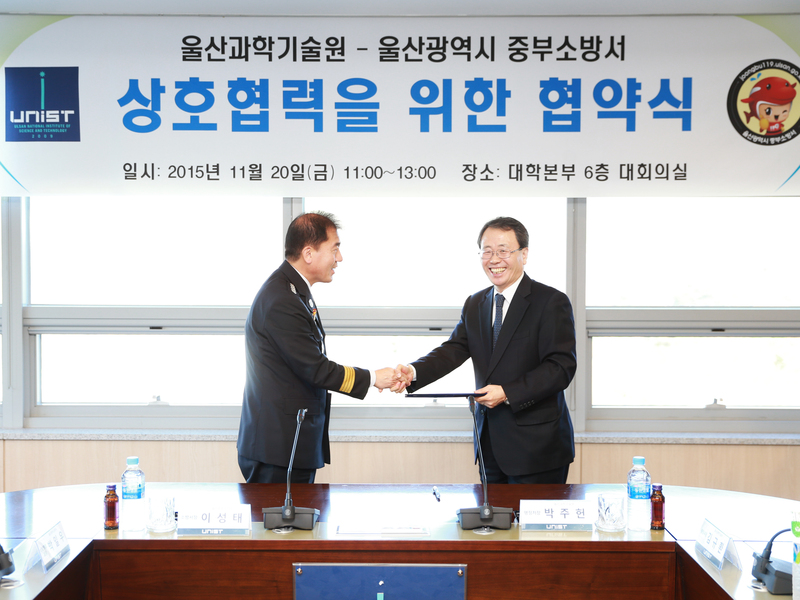 In the memorandum of understanding, the two organizations promise to expand cooperation in various areas, including fire safety and prevention outreach materials and educational programs, and disaster management system for UNIST employees and students in the event of a fire or other natural disaster.